The first few months of 2017 have been busy in our office, with a lot of behind-the-scenes work on our Fellow nomination process. We are also getting ready to announce two new partnerships and a campaign later this year - so watch this space! 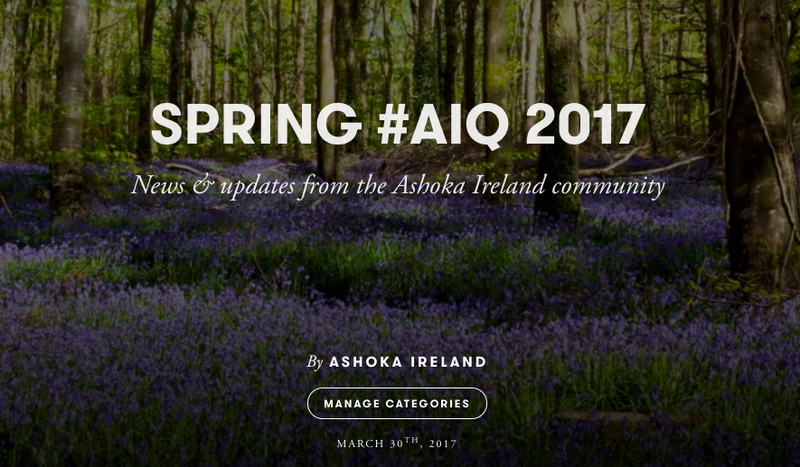 In the meantime, we are delighted to share our quarterly round-up of news from the Ashoka Ireland community, in our spring #AIQ newsletter, below. You can read about a system-changing collaboration between Fellows Neil McCabe and Mike Feerick, and learn about leading global Fellows in our #GlobalChangemakers campaign. Changemaker Schools got a big feature in The Irish Times this month. And we celebrate the work of Jacqueline Williamson, who is our first Fellow to join the network from Northern Ireland!